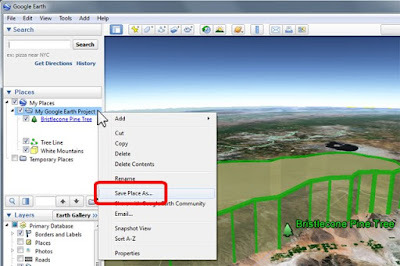 Google Earth allows you to save your project to your computer in the .kmz file format. Enter a name for your .kmz file, and click Save to save it to your computer. You will now find your KMZ file on your computer. You can share the map you created by emailing the .kmz file to your friends and co-workers, posting it on your website with a link to download it, or embedding it with Google Earth on your website or blog. 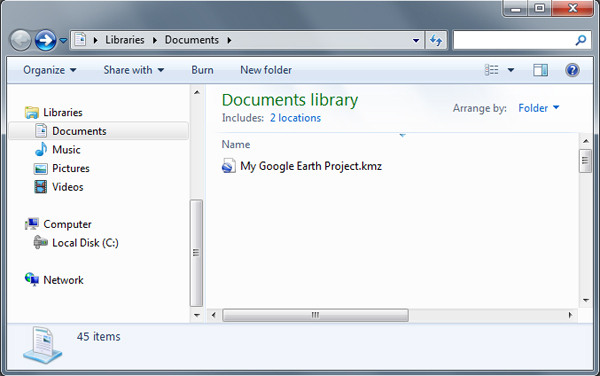 A Google Earth project file is a KML file, with a filetype extension of .kml or .kmz. KMZ files are compressed files that are smaller than KML files. If you used any custom images or photos from your computer, Google Earth will include them in compressed KMZ files so that others can see them too. We recommend saving your Google Earth projects as .kmz for a smaller file. When you save your Google Earth KML project file to your computer, it is private. If you upload the file to a web server, or e-mail it your friend or colleague, then it is no longer private. This is similar to putting any file, such as a PDF file, up on the web or e-mailing it to someone.